Arnold Schwarzenegger plays a machine with advanced artificial intelligence in "Terminator 2: Judgement Day" (1991). When it comes to artificial intelligence, NASA and other space agencies are nowhere near building a "Terminator" in space. 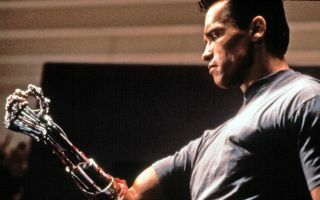 So, you can rest easy — Arnold Schwarzenegger isn't about to hunt you down because you're leading a rebellion against the machines. "The key question for humanity today is whether to start a global AI arms race or to prevent it from starting. If any major military power pushes ahead with AI weapon development, a global arms race is virtually inevitable, and the end point of this technological trajectory is obvious: Autonomous weapons will become the Kalashnikovs of tomorrow," the letter read, referring to the automatic weapons. Musk and Hawking also expressed concerns about AI separately. In 2014, Hawking said artificial intelligence might end up annihilating the human race. And just a few weeks ago, Musk mused in a documentary that AI research might create an "immortal dictator from which we could never escape". Rogue AI is a popular theme in science fiction, ranging from the programs in "The Matrix" film series to the computer HAL in "2001: A Space Odyssey" to the Cylons in the 2004-09 reimagined version of "Battlestar Galactica." But scientists say that thinking of these machines as killer automatons is simplistic and not representative of reality. There are many real-life uses of AI in astronomy. For instance, one team is using artificial intelligence — more precisely, "machine learning" — to recognize and classify exoplanets that are similar to rocky worlds in our own solar system, like Mars and Earth. The researchers on that team told Space.com they are using an artificial neural network, which behaves a bit like a human brain in the way individual neurons connect and how the network learns from experience by examining images and data to form conclusions. This system can recognize what elements are in a planet's atmosphere by analyzing the light from the world's parent star passing through that atmosphere. From there, the system can find elements that might indicate the world is hospitable to life, such as oxygen or methane. "For researchers, AI used in this way will make the classification of Earth-like exoplanets detected via space-based observatories easier," Christopher Bishop, a member of the team who is with the Center for Robotics and Neural Systems at the University of Plymouth in the United Kingdom, told Space.com in an email. The use of deep learning isn't limited to planet hunting. While human volunteers on projects such as Galaxy Zoo help astronomers classify galaxies today, artificial intelligence is emerging as an alternative, said astrophysicist David Koo, an astronomer emeritus at the University of California, Santa Cruz, and astronomer emeritus at Lick Observatory. He recently co-authored a study (now on prepublishing site arXiv and accepted in The Astronomical Journal) in which researchers simulated galaxy formation and used that simulation to train an artificial neural network to classify galactic images from the Hubble Space Telescope. "Human beings are good at recognizing complex images and being able to put them into categories, but the boundaries are always a little soft," Koo told Space.com. The advantages of a deep learning system are that, unlike humans, it doesn't get tired and it can grade consistently..
Future interstellar spacecraft capabilities might include not only classification, but also navigation. NASA recently awarded a $330,000 early stage grant for autonomous spacecraft to dodge debris using technology employed in a competitor to Bitcoin. "I hope to develop technology that can recognize environmental threats and avoid them, as well as complete a number of tasks automatically," principal investigator Jin Wei Kocsis, an assistant professor of electrical and computer engineering at the University of Akron in Ohio, said in a statement. Bishop said he expects his planetary classification system would be more useful on an AI-equipped spacecraft than on a human-piloted vessel. "The first extraterrestrial exploration of exoplanets will most likely be achieved using robotic interstellar probes, since the problems of long-duration human spaceflight and their related engineering and propulsion challenges have still to be solved." The worries concerning AI persist. But Bishop struck a more hopeful note, because he said human capabilities will remain unique no matter how powerful AI becomes. He said that AI is not conscious in the same sense that humans are; humans possess unique capabilities such as morality, self-reflection, creativity and even emotions such as love, hate and intuition. He pointed to science fiction as demonstrating a fear of humans "relinquishing control over their lives to a machine," but said there are many tasks that AI already performs. "A lot of manufacturing tasks use AI in their processing, bypassing human operators. Credit scoring is done with intelligent algorithms. Whether you are given a loan by a bank or not can be depend on what a machine thinks about you. Stock market transactions can be done based on machine learning of trading patterns. Driverless cars use AI for guidance. Some kinds of warfare can be conducted with intelligent drones," he said. This story was inspired by Episode 5 of "AMC Visionaries: James Cameron's Story of Science Fiction," which airs Monday at 9 p.m. EDT/PDT (8 p.m. CDT). A companion book is available on Amazon.com.